Of the four existing monuments of the Cloister of S. Augustine, as we said in the Table LXI, this is the third dedicated to the memory of the learned Cardinal Jacopo Ammannati, distinguished patron of the arts and sciences, and he himself not the least among the scholars and scientists of his time. He was a native of Lucca, where 1422 was born of a noble but poor family. He was secretary of the Latin letters under Pius II, that I adopt in their Piccolomini family, but after he had done before the wicked Sigismondo Malatesta, ch'erasi ribetllato against the Pope, and (costrettolo), to return to his lands, was in 1460 in grace of signal service so appointed bishop of Pavia, and the following year to December 18 was decorated with the sacred purple (utolo) S. Griscogono . He died on September 10 of 1479 in the castle called the caves of S. Lorenzo at Belsena , and his body was transported to Rome followed by numerous retinue . He wrote the life of this outstanding Cardinal Jacopo da Volterra his secretary, and was as published in Lucca in 1712 by P. Sebastiano Paoli. This monument has great similarity with that of Costanza Piccolomini, and it may be supposed to have been the architect one who led them both, for they by rising from one to the other that it does not run that little more than a year. 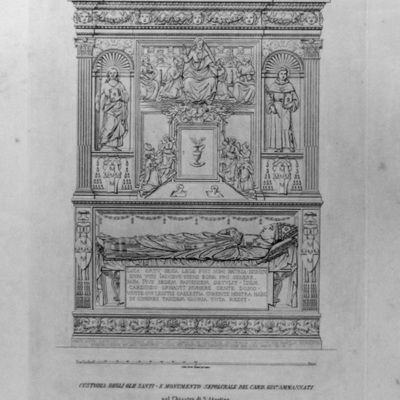 The inside part has the same coffin with the remains of extinct Cardinal, which is (finacheggiata) by the arms of the Piccolomini house carved it 'side pillars. Which weapons you (ripetone) under the two niches of the upper part as occupied by St. Nicholas of Tolentino and St. Giacomo of Maggiore. The story carved in the middle represents the Last Judgment. Over there is the figure of Christ surrounded by 'the twelve who are with him in that extreme day. A 'his feet, very prominent angels that fans feel the horrible sound of the trumpet, and below the messengers of heaven with one hand welcome the righteous and the other point to them the way of the heavenly homeland. 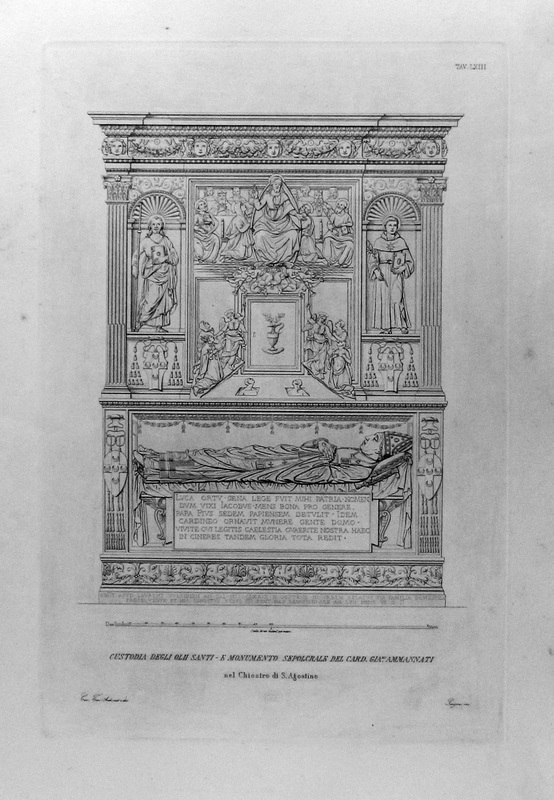 Drawn by Francesco M. Tosi, “Custodia Degli olii Santi - E Monumento Sepolcrale del Card. Gia. Ammannati nel Chiostro di S. Agosline,” LLB Galleries, accessed April 23, 2019, http://artgalleries.milne-library.org/items/show/281.